I’ve just watched the controversial film Anonymous, released last year in 2011. This is the story of Edward de Vere, Earl of Oxford (1550-1604), set in the years before the royal succession in 1603, with flash-backs to the hero’s early life. Oxford starts out at the court of Elizabeth I, is forced to marry into the Cecil family after committing murder, has an affair with the queen and makes her pregnant, eventually delivers on his early literary promise by writing a series of popular plays (for which William Shakespeare is paid to take the credit), plots against the Scots succession to the throne, and ends his life in failure. What I got was a dramatisation of the Oxfordian theory on the authorship of the most powerful literature in history. And a rehash of the slurs on the Virgin Queen’s virginity. Nuts? Of course! The story is pure conjecture and ignores the available evidence. My view is that Shakespeare was the author, that Elizabeth bore no children, and that the Scots succession was the sole practicable option. My only inquiry into alternatives to Shakespeare has been a quick read (long time ago) of an obscure book, The Green Cockatrice by Basil Iske*, which nominates an Irish nobleman, William Nugent – equally nuts, but the footnotes were interesting. I like to pick through such details, and the authorship controversy doesn’t trouble me. So I enjoyed this film: a good yarn, well plotted and acted, paced fairly well, with some juicy scenes. During the St Crispin’s Day speech from Henry V – “We few, we happy few, we band of brothers“ – the groundlings crowd the stage in a fervour of patriotism, chanting against the enemy, and there’s a marvellous bird’s eye view of their arms stretching out to the actor, like a flight of arrows. 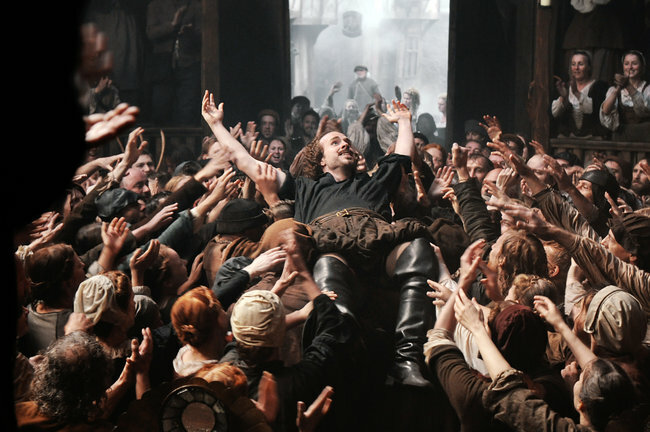 At the end of the first staging of Hamlet, the opportunistic Shakespeare accepts the plaudits of the audience – an “author, author” moment – and explores his role as a renowned playwright by crowd-surfing the groundlings, with his arms spread wide and a great grin on his face. I laughed out loud. So there’s humour in this. And for those who mock the conspiracy theory, the film redeems itself with some healthy irony. I won’t spoil the plot, but upon the resolution of the issue of who-begat-whom, one character describes it as fitting of a Greek tragedy, and another tells Oxford to put it in one of his plays. With material like that Shakespeare would have been in like Flynn. One aspect I didn’t like was the traducement of the Cecils – the father William and son Robert – who were Elizabeth’s principal secretaries. They are portrayed as grim puritans, bent on dominating the royal succession and crushing the ambitions of loyal aristocrats such as Oxford. Cecil senior always gets a bad press from literary types (see the fluffy Shakespeare in Love, where he was played by Richard Attenborough), which I assume is down to resentment of his notorious reaction to the queen’s proposed gift of money to the poet Edmund Spenser for The Faerie Queene: “What, all this for a song!” Cecil senior was truly the politician of his age and a man of deep intelligence and learning. The same should be said of Cecil junior, although he was horribly devious. Another libel is in the portrayal of Anne Cecil, who marries Oxford and spends her life scorning her husband’s art. She and her sisters were recognised as the most educated women in the country, so it’s unfair to cast her as a shrew. But a good story needs vivid villains, and the Cecils fit the bill. To counter the Cecil libel, the writer might have included a scene showing Elizabeth spoon-feeding the dying Cecil senior (it did happen), which would also have deepened the irony over her motherliness. Another trick missed was Elizabeth’s death-bed dismissal of Cecil junior – “little man, little man …” – to show she was aware of the manipulation but powerless to stop it. The most touching moment of the queen’s decline, when she holds her finger in her mouth like an artless child, is true to the historical record and nicely played by Vanessa Redgrave, but the film’s characterisation of Elizabeth is untrue. The visual recreation of Tudor London through staging and special effects has been highly praised by all sides – “best ever” – but nothing outlandish: every shot is stuffed with the usual leather jerkins and puffy sleeves. Many many liberties are taken with events, particularly the slaughter of the mob supporting the aristocrats – a perfect perversion of the record. Whatever your view on the authorship theory, beware the facts in this drama: their treatment is Shakespearean. Overall, Anonymous is good entertainment with some interesting chewables on history and story telling. For the controversy over Anonymous, start with Shapiro’s criticism, which sets up a battle between the elite and the common people. Apt in a world of blameless bankers. A similar line from the New York Times. And an absolutely excoriating piece by Ron Rosenbaum – man, does he hate this film! And from British film critics, three reviews in the Guardian: the Good , the Bad and … the Postmodern. Each takes a different view, and the comments afterward are nice and spicey. It passes the time! * Basil Iske = basilisk (snake), a heraldic emblem of the Nugent family. The author was Elizabeth Hickey. My reading of Shakespeare’s Sonnets perhaps might clarify how things actually occurred. A veritable translatio imperii and roman à cléf. You write well, and there’s plenty to read. Your site doesn’t allow comments in my browsers. SG very kind of you to say. I would like to enable comments but apparently doing so requires enabling page level permissions. And I just never looked into that. I’ll have to consider but I would love receiving comments regardless and my email address is listed for just such a purpose. And I welcome as well any thoughts on a meta analysis.